An Australian-funded project to improve the roads surrounding the market in Lorengau Town is nearing completion. The project has resulted in major improvements to the roads, drains and footpaths around Lorengau Market that will improve access for all Manusians. It forms part of the ongoing project to ugrade and reseal the road from Momote Airport to Lorengau Town. 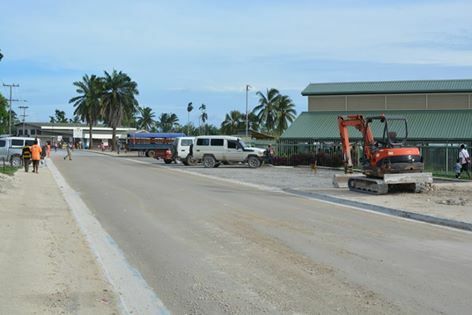 Nixon Solomon, President of the Manus United Disability Association, is pleased to see the project has resulted in smooth sealed footpaths and kerb ramps. He notes that these will provide safer access to the market precinct and town amenities. “The market is the economic heart of Manus. To have these seven ramps will make life easier for wheelchair users in the province. It is pleasing to see the project consult with a wide range of stakeholders so features like kerb ramps are included. This makes a real difference to our lives,” Mr Solomon said. At the centre of the provincial capital, the improved road connects local shops, hotels, and banking facilities to the new Australian aid program funded Lorengau Market. New footpaths have now replaced uneven and eroded pathways that were unsafe and impeded access. Alongside these visible improvements, major works have been undertaken to install over 700 metres of upgraded drainage. This will reduce the risk of the market flooding and improve the reliability of the surrounding roads in all weather conditions. The newly sealed roads also provide plenty of parking spaces for market-goers. The Australian High Commission’s Minister Counsellor, Benedict David, was impressed with the improvements. This project is an Australian aid initiative delivered through the Papua New Guinea – Australia Transport Sector Support Program.